Stepping up a day too late for Theme Thursday - as it's now Friday. Steps have been difficult and rather painful for the past couple of days, due to a procedure I had done in hospital on Tuesday. But things are better now. Sorry to hear you're in pain! Hope the procedure was to cure any ills and ails that were plaguing you. Dennis had a painful procedure once, at the Vet's. The drugs were nice though. 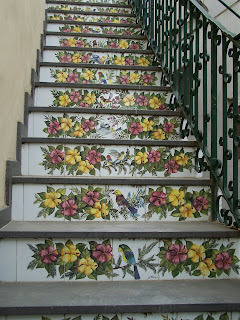 These steps are very flowery. Dennis wishes your pain would go away FAST. Cardiac catheter doesn't sound very pleasant; hope you have a better weekend, pain free.